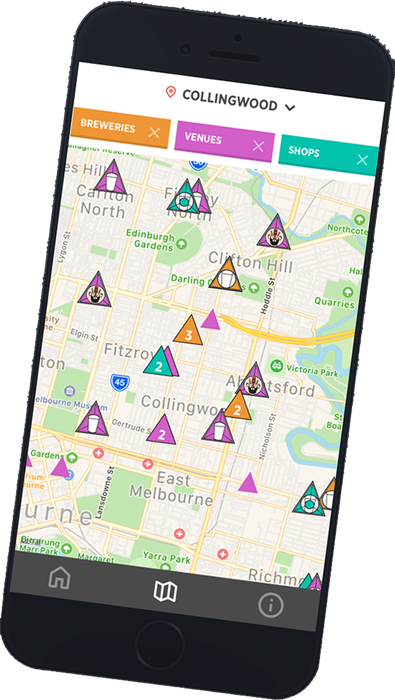 We’ve built an app to help beer lovers find good beer when they’re out and about – and it’s yours for free. Rather than replicate the Crafty website, we’ve flipped it on its head and pulled the map and all the info we’ve created on breweries, venues and bottleshops to the forefront instead. Open it up and you’ll find the nearest breweries and venues staring back at you – as well as where to find them, when they’re open, what they’ve got on and more. The interactive map features full listings for businesses subscribed to our directory – including details of Crafty Cabal offers, beers and forthcoming events – as well as links to other good beer operators we’ve written about, suggested Crafty Crawls and more. We'll be introducing new features as time goes by so keep an eye out for updates! Why is my local bar/brewery not on there? Chances are, we've simply not visited yet. The businesses featured in the app are either those that have asked to be listed in the Crafty Pint directory (and meet our requirements) or those we've written about on the site. This curated approach ensures we're happy to send readers in their direction, confident they'll have a good experience. We're always looking for good beer businesses to visit and add so, if you work at one or want to tell us about your favourites, get in touch. How do I get my brewery/venue/bottleshop onto the map? Again, drop us a line. How to I report an issue with the app? If you've noticed an issue – wrong placement of a pin, incorrect opening hours for a venues, missing info, for example – please send us an email so we can rectify the situation. We regularly remind listed businesses to ensure their pages are up to date, but people get busy and some things occasionally slip through. What does the weird beardy, grainy face signify in many of the map icons? This means those venues are running a special offer for members of The Crafty Cabal. This is a subscription scheme for readers: sign up to become a Crafty supporter and gain access to heaps of deals, discounts, competitions, giveaways and exclusive events. Head here for more. Why doesn't the app do ....? If you've got a great idea for a new feature or enhancement, let us know. This is a fluid beast so we're open to ideas!